In a single life-changing moment, five cash-strapped supermarket employees become unlikely millionaires when their lottery pool wins big. It seems like a godsend, but the syndicate soon learns that good fortune has a price. 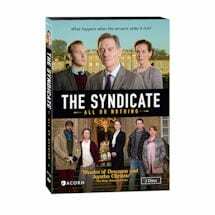 This taut British drama follows each character in turn as they deal with guilt, health crises, the past, and troubled relationships. With Matthew Lewis (Harry Potter), Timothy Spall (The King's Speech), and Joanna Page (Love Actually). 5 episodes, 4 1/2 hrs, 2 DVDs, SDH. What starts as a typical day for five supermarket employees ends with a birth, a robbery, an assault, and a windfall that profoundly alters their lives. 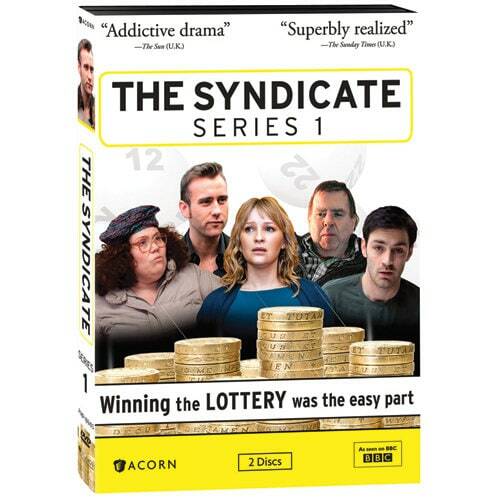 Assistant manager Stuart, broke and staying at his mother's house with his pregnant girlfriend, hatches a plan with his brother, Jamie, to get some quick cash. Devastated that her husband has moved out, Denise sets out to win him back, but Leanne worries that her plans are too radical. Meanwhile, the police question Stuart further about the robbery, and Bob's brain scan reveals an abnormality. Bob reevaluates his life and relationships after getting his test results back. Stuart confides in Bob about the robbery and looks to Leanne for comfort. The group locates a surgeon in South Africa who may be able to help Bob, but he hesitates. Stuart and Leanne share an intimate moment at Bob's party, after which Leanne panics when she discovers her daughter missing. Stuart's efforts to help Leanne cause a rift with his girlfriend, Amy, who takes extreme measures to exact her revenge. Jamie feels invincible now that he's rich, but he soon finds that his shady past can still wreak havoc on the present. Leanne faces consequences for her actions, Stuart wrestles with his romantic desires, and Bob takes a long-overdue honeymoon before his surgery. Rating: NR. Contains coarse language and druge use.